Summer has arrived and we are looking forward to another busy season at Glenaldor and we are thrilled with recent news from the top review site Trip Advisor to get us off to a great start. I guess everyone will have heard of Trip Advisor, the website where people can freely review and rate Guest Houses and hotels which can then be viewed by other potential customers. It is widely regarded as the most popular website visited by people before they book accommodation therefore we were over the moon this week to be awarded a Certificate of Excellence from them to recognise the constant 5 star rating given to us by our guests. 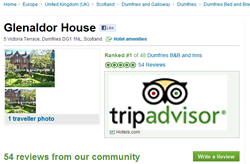 To top this award we have just went to number 1 on Trip Advisor for Guest Houses in Dumfries and Galloway. One of the main criteria for this rating is quantity and consistency of reviews therefore as we only have 4 letting rooms we feel this is a great achievement for a small family run business. Since starting with Trip Advisor 2 and a bit years ago we have been steadily climbing the ratings therefore the big task now is to ensure we hold on to the top spot for a while. It is great to know that all the hard work and thought that goes into trying to ensure all our guests have a great, comfortable and enjoyable visit to our house has paid off and that we are on the right track. A great big thanks to all our past visitors in taking the time to write such positive reviews, it is genuinely appreciated. As the summer season begins we are busy getting our hanging baskets ready and are looking forward to welcoming guests old and new to Glenaldor and hope they enjoy their stay. For the future we have been lucky enough to purchase the property next door to Glenaldor. As described on our website it is the house where J.M. Barrie, author of Peter Pan and many other novels lived during his schooldays inDumfries. It is believed he had the inspiration for Peter Pan whilst he played with friends in a garden nearby. The building is listed as a building with historical interest and we are in the early stages of consulting with the local planning office to see what can be done with the building in terms of restoration – I will keep you posted in the next chapter.